I've recently decided that I need to make some changes in order to lead a happier and more positive life- there are a few things that aren't working for me and I really want to put effort into improving them. I'd like to use this blog as a tool in aiding these improvements, as it's nice to have something tangible in which I can map my progress. I also want this blog to be positive and to help others to stay positive, so there's that too! I thought I'd kick things off by outlining all the great things I've done this year. I have to say, 2017 has been a far better year in comparison to, well, basically every other year in my life! I feel like I've made so much progress as an individual in this year, and I think that deserves a blog post! I can be pretty hard on myself, so hopefully reviewing all the good things that have happened this year will encourage me to go a bit easy on myself. I've been pretty busy on the essay front so this is going to be the only photo I upload on this post. I think it's apt though, like it's the sun setting on 2017. Also, it's pretty. I applied for a job, attended the interview (a group assessment!) and got offered the job! And damn was it a challenging job! I've never missed a day of medication. I've often forgotten to take medication in the past- it can be pretty easy to slip your mind! So I'm pretty impressed with myself that I've remembered to take it everyday! I've bitten the bullet and started putting my blog out there. For someone with low self-esteem this is very scary- why would anyone want to read my blog? I'm working to kill this mindset though, and part of this includes believing in my hobbies like my blog. So far, so good though... I'm certainly glad I cast my fears aside because I've only made progress! I've learnt I am able to handle bad/upsetting situations with grace and maturity rather than getting irritated and acting impulsively. I feel so much better for it! Getting mad and trying to tear people down or insult them provides no real gratification (and honestly, if you're secure enough within yourself insults mean eff all), but I actually feel happy for responding in a honest yet dignified manner. I no longer get worried about my essays. When my anxiety was really bad essays and uni work was always on my mind. The worry and stress was almost painful. This year, however, I've been able to approach my work with a calmer head, which has made it so much easier to be productive. I'm finally starting to love myself I hate that phrase. I'm generally not a lovey-dovey person and the whole 'love yourself' concept is just a bit too soppy for me. But my relationship with myself has improved leaps and bounds. I've realised in this past year that I'm actually kind of fantastic. Just a bit. This may or may not be the last blog post for a while. Not because I'm done with blogging- far from that, actually! Lately this blog has been infinitely helpful in improving my mental harmony. I've found so much happiness and positivity in blogging, which has inspired me to properly dedicate myself to it. Therefore, I'm taking a break to focus on developing my blog. I've got so many plans for it, which I'm really excited about, but I need time to develop these plans and then put them into action. Happy 2018 everyone, I hope this is your best year yet and thanks to everyone who's read my blog, left me a comment or followed me on social media, it means so much to me and it means my year has ended on a great note!! Much to my dismay, most of my (admittedly generous but also very much needed) Christmas break is going to be dedicated to essay writing, rather than getting fully immersed in the festive season, as I would have liked. I'm sure this is the case for many people in education, particularly at undergraduate or postgraduate level. I LOVE Christmas so I don't want to compromise, therefore I'm going to work on ways to keep the festive spirit going whilst writing essays (or even studying for exams for that matter!). Hopefully this is somewhat motivating! Make you study space festive. Fairy lights, tinsel, baubles, even a little tree... I'm sure you know to make you space look cosy and Christmassy! Or work in an already festive space. I've taken to inhabiting the living room, which is all decked out for Christmas. Christmas music!!! Pretty much a given. It's always fun to sing along while enduring the pain of reaching the word count. Try not to cry thinking about the joy of Christmas while your essays keep you chained to your desk, though! Warm, comforting hot drinks- make them festive if you can! A sprinkle of cinnamon goes a long way. There's festive instant lattes sold at some supermarkets (like the Nescafe toffee nut latte at Tesco, which I have sadly yet to get my hands on. I did try it last year though and it's luxury, honestly. Almost as good as the Starbucks one!). There's also mulled wine/cider if you want to push boundaries, though doing your essays under the influence of alcohol is maybe not a good idea so try to avoid going overboard (even if it does numb the pain haha). And if you're feeling particularly naughty and have a few spare quid lying around get a Costa/Starbucks/Cafe Nero or whatever coffee shop coffee you like 'cos why the hell not. 'Tis the season to be indulgent, is it not?? I really wanted a toffee nut latte for this post but I wasn't able to get my hands on any in time, so this is a vanilla latte with a pinch of cinnamon. Still tasty! Festive snacks. I'm not going to list festive snacks, I'm sure you have your go-tos. Plus you need the energy, essay writing is draining and essay writing during the Christmas period is just bloody miserable, so obviously you have to eat. I don't think you need much more convincing than that! Little trips out to soak up the festive atmosphere. You need a break, so make that break as festive as possible. Take a walk and check out all the pretty Christmas lights, hit up a Christmas market, do a little Christmas shopping (or, on second thoughts maybe don't because Christmas shopping can be pretty stressful...maybe Christmas window shopping?) etc. Break out the Christmas jumper (or the Christmas pjs). Christmas jumpers are so fun, great for keeping your spirits up while trying to motivate yourself. You can get 'em nice and cheap from Primark. Festive scented candles. I'm a huge scented candle fan, I've definitely mentioned them in other posts! Around this time there are loads of festive scents around, and you can get them really cheap too (...from Primark, I'm also a bit of a Primark fan, if you couldn't tell). Get a log fire going (or, failing that, get a virtual one on your laptop or TV). We have a log fire but we never light it (damn, I wish we did, it would be so delicious). A bright, crackling log fire on the TV is the next best thing... it does actually make the place feel more cosy, and we all know it's easier to write essays when you're feeling cosy! My little TV log fire. It's basically the real thing, provided you have a very active imagination. I hope essay writing isn't totally killing you and you're also enjoying the festive season. This is going to be my last blog post before Christmas so... Merry Christmas! (and, um, a happy new year too if I don't get round to publishing my other post before then). The final instalment in my travel diary! Once again, I loved writing about and reliving my travels! I hope to do this again soon... I just need to book another holiday! I hope you've enjoyed reading about my travels as much as I've enjoyed writing about them. They after Venice we visited Sibenik, Croatia. Yet again, we had another tour booked, though this is one I'd been pretty keen on booking a while before the actual holiday so I was quite looking forward to it. This one was to Krka national park, which was incredibly scenic, especially with the pretty waterfalls. After the coach had dropped us off at the site we took boat ride to the main area. The wait for the boat was just mildly excruciating as the fierce heat reared its head once again. The boat ride was lovely, not just because it was welcome relief from the heat! We were treated to many nice views as we were transported to the main park. Once in the park we were given a chance to have a dip in the lake, though we sadly did not have our swimming cozzies with us so we had to suffer watching others cool of in the water while we struggled to find a place to sit. This was followed by a small hike (which is NOT an easy feat in 40 degree heat. The rhyme was totally unintentional but still brilliant if I say so myself). Also, I'm not fit enough for a hike, especially on holiday when I've been stuffing my face. However, our suffering paid off as it meant we could see the waterfalls- a perfect photo op!! After our hike we boarded the coach to be delivered back to the port. Considering how cool it sounded and how excited I was for it I have to say, it was a bit of a let down. It was stunning for sure.... but there was a hike. In 40 degree heat. It certainly made for nice pictures though! Can you see little slice of ship in the right hand corner?? Following Sibenik, we stopped off at Dubrovnik, Croatia's capital. Once we again we kicked the day off with breakfast in the cabin (I bet you can sense a theme here haha! ), as we'd been doing at pretty much every port of call. I'm writing this quite a while after the actual holiday and I can say I'm sorely missing having a luxurious breakfast delivered to my room, especially in this chilly weather. Why is that not a thing? Anyway, I've strayed. Back to Dubrovnik. This time we (well, technically not my family personally as this was another tour, so it's the tour company really) bucked the trend of taking a coach to our destination. We were, instead, transferred by boat. It was so nice cruising along in the sun, surrounded by serene waves and stunning, vivid scenery. The boat took us to the old town (it probably has a more specific name but that's what I wrote down) where we were given a short (thankfully, it was pretty sweltering round here too) guided tour of the town. I invested most of that time in practising my photography skills. I don't mean to brag, but I think I captured some pretty neat photos, I was very impressed with myself. After the walking tour we had one hour of free time to explore the town by ourselves. I invested this time wisely, making a necessary purchase- (overpriced) sweets. That was pretty much the end of the tour, and we were transported back to the ship via the water taxi (idk what a water taxi is specifically but I thought it sounded a bit more fancy than 'boat'). Before we jumped back on the ship, however, we had one final adventure in Croatia, seeking out a supermarket as we were getting low on the drinks front. Yes, there are drinks available for purchase on board the ship but we are cheap and wanted to save a few quid. So we stocked up on some decently priced booze and soft drinks (I do like me some Coca Cola!) from the local supermarket. I would like to pause at this point and comment on the fact that in Croatia they sell Vodka in a box. It's 3 litres. It was really cheap, around £15 maybe?? I don't know if this is common in other places but I don't think I've seen such a thing in the UK; it amused me greatly. Anyway, drinks purchased, we headed back to the ship happy as clams when tragedy ensued- my father dropped one of the bags he was holding causing the glass bottles in there (yummy cocktails- Cuba Libre and Cosmopolitan) to shatter and spill everywhere. Only one bottle survived. I was sad about the lost bottle for at least half an hour afterwards, until he nipped back out for more beer and also replaced the missing cocktails. So that trip ended on a sad-ish note that was promptly forgotten about as I downed my bottled Cuba Libre. Messina, Sicily was our second port of call. However, took a trip up to Taormina as there's more to do there then round the Messina area. The coach right was spectacular- the views were something else, with beautiful landscape and azure sea. Mount Etna was even visible, giving a chain smoker a run for their money. Though I loved observing the scenery I'm pretty sure I napped for a good portion of the coach journey. Whoops. The spectacular views weren't restricted to the coach ride- once we arrived I the town we found we actually had a birds eye view- absolutely phenomenal! The area we went to had lots of shops and cute cobble stoned streets. It felt very Italian. I also have to note, the locals were all so stunning looking, I felt like such a potato there! We, fortunately, managed to try some gelato, pizza and cannoli. I would have been pretty upset if I had missed out on trying those in Italy. Out trip was a brief one, sadly, but it was definitely not one I'll forget. I think it was my favourite? the views really one me over. Look at how beautiful the sky is here! I don't think I've ever seen such a rich, deep, sapphire sky :o All my photos taken here are this stunning, vibrant shade of blue! Next up was Venice, which I was really looking forward to as I'd been wanting to visit it for a while now. While it had been pretty hot in the previous two places we'd visited, this is where we really felt the true potency of the heat. We had another tour booked, which kicked off with a motor boat ride round the water canals, looking at the sights from the boat. I must say, it was pretty damn cool to be able to cruise around in a boat and see all the lovely views. We stopped off at a glass factory where we witnessed some glass being blown, as well as being given a chance to look around the shop. There were many pretty, ornate objects in the shop. Unfortunately my student budget didn't quite stretch enough for me to be able to purchase something. We were then transported, via the motorboat, to the main area (I'm pretty certain that's not what it's called but the name has totally escaped me. Actually, I tell a lie, I never had the name in the first place.) Anyway, it's the area where one can take a gondola ride, which is precisely why we were there. This sure was the most exciting part of the trip for me- I'd always wanted to take a gondola ride! We were presented with the challenge of dealing with following the guides through hoards of people in temperatures that I'm fairly certain rivalled with that of hell to get to the... gondola station? Again, not sure what to call it but this seems fitting to me. There really is recurrent theme of me not knowing the names of things in this post haha. It was super worth the struggle though! If you ever in Venice a gondola ride is a must. Frankly, it would be sacrilege to go and not experience one! Anyway, once that had disappointingly ended we headed back (through the crowds and the heat once again) to the motor boat to be transported back to the ship. Our penultimate destination was Cagliari in Sardinia. Honestly, there's not an awful lot to say as we didn't do an awful lot here. There wasn't an awful lot to do, plus it was a pretty short stop- the ship departed at 3pm. I've been to Sardinia before and the area we went to at that time was gorgeous, so I was throughly disappointed with this stop. I was honestly expecting white sandy beaches with crystal blue seas and donkey rides like my first trip but, sadly, there was nothing so exciting round here. We ended up spending time wandering round shops. The one plus is that we found a lovely jewellery shop with a good sale on so I managed to get some cute rings. That's about it though. Our first port of call was Cadiz. We disembarked later than we normally would, which I quite liked- it made for a more relaxed visit. Cadiz seemed pretty different to the last time we visited, but still lovely nevertheless. We started off by wandering around a bit, before hitting up a cathedral which was beautifully ornate- very visually pleasing! We stopped off at a stall selling paella and sangria, which is pretty much mandatory to try in Spain imo. We wandered around a fish market which was a bit smelly but also disappointing because we couldn't actually buy any of the fish, even though a lot of it looked like it would make for some epic meals. We dined at a small, cute restaurant. I had battered prawns, which were tasty. We then headed to a local supermarket to take advantage of the cheap booze, before leisurely making our way back to the ship (I picked up a cute necklace on my way). Gibraltar, our final port of call, was definitely the least exciting. That's partly because I've been a few times before, but also because it seems to be what I'd call a 'filler' place. It's very similar to the UK, which has its upsides but also its drawbacks. It was just kind of like wandering round my local town centre. However, the booze is cheap as there's no VAT or something like that, so I managed to get my hands on a 1 litre bottle of Absolut Vodka for £11, which is way less than what I'd have paid for it in the shops! It was a really cool flavour, acai, blueberry and pomegranate. In case you're wondering, it was as yummy as it sounds.Since there wasn't much to see or do there we didn't take a single photo. I suppose I could upload a photo of the Absolut, since I actually still have the bottle. It's acting as a bookend. It's doing a pretty good job, in case you were wondering. It's been a couple of months since I came back from this holiday but, since I enjoyed writing about my holiday so much last time, I thought I'd do another. It's a nice way to relive the memories. However, because it was a pretty long holiday, and also because I'm lazy, I'm basically just going to outline the highlights and include some pretty pictures. Because I write to much that didn't quite happen, so while I'd intended to shove it all in one post said post got too long and I've had to split it up. This year's holiday was, once again, a cruise. However, it was a blissful seventeen days around Southern Europe- much needed after a gruelling four week summer job. We sailed with P and O cruises again, though this time we chose their ship 'Aurora.' A considerably smaller ship it was cosy with a more classical interior design. I particularly liked the Art Deco influences, though I slightly missed the fresh contemporary air of Britannia. The days at sea were roughly the same, so I thought I'd sum up what we typically did in this post. I'd usually wake up and read for around an hour with a coffee before hitting the gym for another hour. I'd shower once I got back and get ready for the day. This would then be followed by a combination of reading/exploring the ship/listening to music/napping/doing the daily crossword and sudoku (we're too cheap to pay for onboard internet... plus I kind of like brainteasers. I'm a bit weird like that). The lift area, which I was just *slightly* fascinated with- lovely interior design! The atrium. Smaller than previous ships but it still had character. Plus there was no risk of getting lost haha! This is a general view of the ocean from our cabin on a sunny day. This is honestly such an amazing view to have, mostly because it's not everyday that your view is the damn ocean!! Then lunch, obviously. Usually eaten at the buffet, sometimes at the poolside grill. The period after lunch was usually spend similarly to the period before, with reading and music. If we were living dangerously we'd spend a bit of time on the promenade deck watching the ocean. There were a fair few times we saw dolphins- one of the biggest highlights of the trip. We'd then get ready for dinner, pretty much always with a nice drink or two. Alcoholic, obviously, because who doesn't like being a bit tipsy for dinner??? We generally dined at the on board restaurant, which is pretty damn posh. Being the architectural enthusiast that I am I was particularly fascinated by the twinkling lights in the ceiling. Dinner's a three course meal with, usually, a fairly decent selection of food. 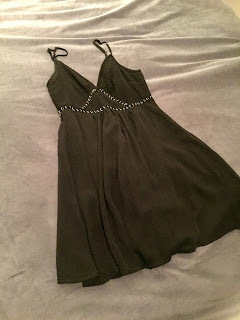 Ok, I managed to get a proper photo of the dress I'm wearing in the picture above. Not that there's that much point because it's about two years old so I'm fairly certain it's no longer available for purchase. Sorry I couldn't get a picture of this fantastic meal, I was too busy enjoying it. Instead enjoy a photo of me enjoying a glass of wine in the restaurant, taken on a completely different day to the one I had the meal on. 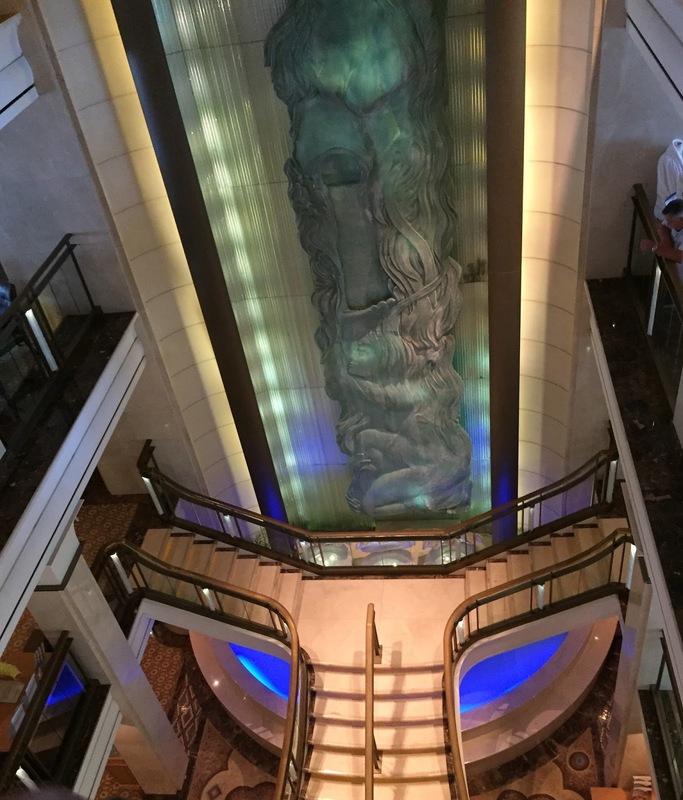 The top deck of the ship, it looks so pretty all lit up! I have a massive amount of essays to do over the Christmas period so I'm not sure how many blog posts I'll be able to churn out over December. I would have loved to have given Blogmas a shot as Christmas is my favourite time of year and I reckon it'd really put me in the Christmas mood, but I know I'm just not going to have the time with so many essays that are all due at the same time. However, I still want to post something festive so I started writing a Christmas gift inspiration post but it was honestly getting a bit generic, plus the list becomes somewhat endless- there are just too many possibilities. If I had the time I would have made a creative and unique gift ideas list (because I'm a fan of creative and unique gifts) but that would have taken me a long time to plan and write and I just wouldn't have been able to fit it in around writing my uni essays. 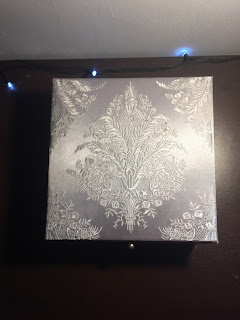 However, in trying to create this post I thought about some of the presents I'd received over the years and a lot of them are really cool and make really good gifts! So I've decided that that's what I'm going to post about instead! My lava lamp. I mean, it's a lava lamp. Is there anything more I can say about it? My star projector. The clue is in the name. It projects green laser 'stars' onto my ceiling and is super cool and pretty. It makes for a really nice atmosphere! Plus it's on a timer, so I can whack it on and fall asleep. It's just like sleeping under the stars, but you're nice and warm indoors. And the stars are green. With the blue cloud function turned on, so it looks like a galaxy! My Gilmore Girls mug. In the last year I've become a huge coffee drinker, and Gilmore Girls is my ultimate favourite TV show, so it's nice to be reminded of it while I get my caffeine fix. La Prairie 'Midnight Rain' eau de parfum. It's the bottle more than anything, but the bottle is absolutely stunning. I think the bottle is the prettiest perfume bottle I've ever seen! The perfume smells really nice too, though I tend to save it for special occasions. It's definitely the most expensive perfume I own too. Jack Wills gift set. Not because of the brand (I grew out of my JW/Abercrombie/Hollister phase a long time ago) but because of the quality and quantity of the products included. The box came with two face masks, a body wash, a body cream, (both of which smell divine!) two nail polishes, two body sprays and (I've definitely save the best for last here) a blanket scarf, generous in size and width. It's done an excellent job of keeping me warm whilst also being comfy and stylish. I was very impressed with the contents of that box! Jewellery box. This is a fairly old one- I must have received this Christmas '07 if I remember correctly- but the sentiment behind it is what makes it special- it was intended to be something I kept for a long time and, I'm pleased to say, a decade later and I still have it! 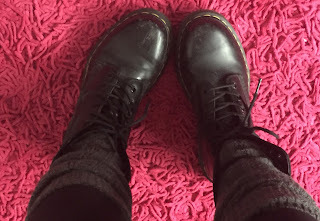 My Doc Martens. They're robust, durable and generally versatile (though I tend not to use them while driving which is a bit limiting). They saw me through two hikes that were hours longs in the Lake District, so they really helped me out there! They're now over a year old and sturdy as ever- I'm so used to my shoes getting worn down quickly so I'm thrilled with how these have lasted. 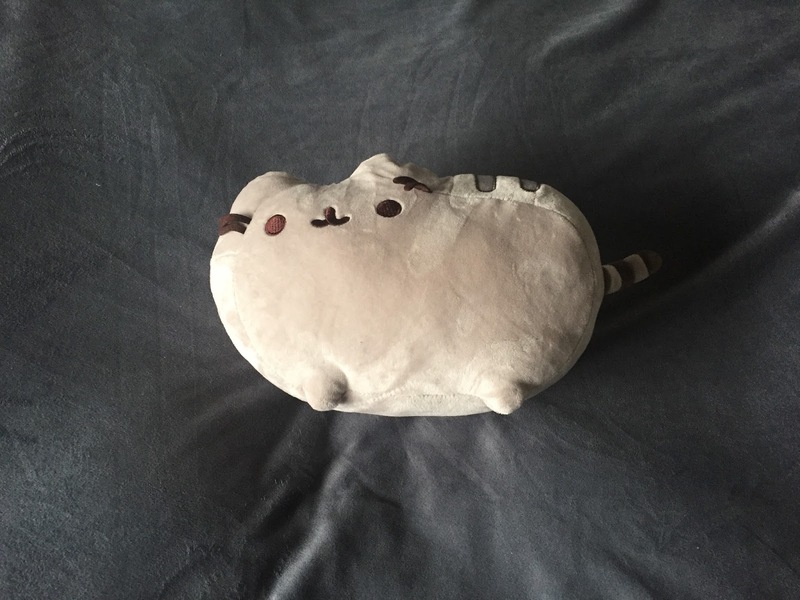 My Pusheen Plush. Another sentimental one- when I was miserable at uni and away from home my mum and I would send each other Pusheen stickers over Facebook messenger. They were so cute, they cheered me up during a very unhappy period. Pusheen is also really cute and I'm just a tiny bit obsessed. A key ring engraved with my car's name. This was a birthday present (confession: about half the things on this list were actually birthday gifts. But gifts are gifts, right?) from a friend. It's so thoughtful, especially as I'd bought my car only a few weeks before my birthday. Yes, my car is called 'Miss Patty.' Yes, it is after the Gilmore Girls character. My iPhone 5. It's not so much the fact that it's, well, an iPhone, something that is a typically desirable gift. I mean, it is partly that, but also, more importantly, it's the fact that when the iPhone 5 came out I was planning on buying it with the money I'd saved (which would have wiped out my account haha. I thought it was worth it since I'd been saving for a while), so I was thrilled to find I had been gifted it instead, despite not asking for it! It's really the fact that I wasn't expecting it at all. Sadly, that phone is no long with me (it was nicked from my suitcase. And no, I don't normally keep my phone in my suitcase!). I obviously don't have a photo of it, but I'm sure you have an idea of what the iPhone 5 looks like! I would just like to say I'm super grateful for all the wonderful gifts I've received over the years. I hope you all have a happy festive period and that this list might be mildly helpful if you're stuck for gifts! This is an informal, chatty blog where I write about anything that's inspired me or that I think is cool and interesting. I hope you enjoy my posts and find some of my ramblings at least slightly useful/entertaining. Want to discuss anything you've read on this blog, have a little rant, get stuff of your chest or generally say hi? My Twitter is @amandamd25 and my Instagram is @amandamaria_9, I swear I'm friendly (on a good day :p)!